The first day at Roadburn Festival is one full of hope, expectation and acclimating yourself to the area the festival is housed in. Predominately, Roadburn happens at the 013 venue with the main stage and smaller Green Room taking on a lot of the bands while across the road the beautiful Het Patronaat begins its final year as a space for live music at Roadburn (the festival organisers found out only within the last month that the venue is being sold and will no longer be a part of Roadburn – it is an institution in itself with many musicians having the goal of playing in the church one day). A short walk away is the newest of Roadburn’s venues – the huge hangar space of De Koepelhal which also incorporates the small Hall of Fame and the Ladybird Skatepark (a space used to great effect this year). De Koepelhal also features the artistic side of Roadburn with the merchandise displayed here, the Full Bleed Exhibition, Marissa Nadler and Emma Ruth Rundle’s paintings and the Kickstarter Games event being hosted in the large Pit Stop area – a place many people are grateful for. Sitting down often is a must. Once you get your bearings then it’s time to find the music. You can plan your Roadburn experience down the very last second but often things come up that mean you put that carefully constructed musical plan to the side. Marking everything you want to see on the TimeSquare app, the programme or your own printed schedules is great but not everything is possible. Of course, there are people who try to do it all, or watch one song to get that perfect Instagram picture and then leave because social media needs to know they were there (this is something I’m sure we are all guilty of at some point) but really, Roadburn is about immersion, for me, and this year I felt more relaxed about my band choices and that I could miss something if I wasn’t in the mood or I needed to eat or sit down or decompress. I marked many things on the TimeSquare app but in the end I let my mood dictate if I would see something or not and I had a much better experience all round. For these reasons I didn’t see At The Gates, either Sleep show, Cave In, or the Dutch black metal scene and their Maalstrom commissioned project – after Dodechedron my heart could not take it and I saw Thou play Misfits covers in a skatepark instead. But I don’t feel like I missed out, rather that I did the festival my own way and that is really OK.
First on this person’s schedule is Canadian duo Vile Creature who released an incredible album last year and are definitely on my own personal “must-watch” list this year, and for a lot of others judging by the queue to enter the Het Patronaat. Their show is intense from the outset with both band members bringing a level of aggression to the fore and guitarist KW speaking of oppression and violence in extremely open terms before they break into their final song. Such performances are tethered to a reality many of us cannot know and Vile Creature showed us that reality with stark words and crushing beats. Thou’s acoustic performance at De Koepelhal is a chance to appreciate the band on another level; their songs are always eloquent and poetic but stripped back the lyrics take on new dimensions and the delicate nature of the words are teased out by the incredible vocalists that Thou are using tonight. It’s the first of four Thou sets (they are this year’s Artists in Residence) and in showcasing various aspects of their musical personality they prove their worth ten times over as an experimental, interesting and important band. It is Heilung, though, that transport those in attendance to the outer limits, their brand of folk bringing primal beats and traditional instrumentation to an audience that lose themselves completely. The trio are joined by many others in order to bring their music to the stage; whether that is via playing self-made drums, being a part of the warrior choir or being an audience open to a band that bring a part of the past with them each time they perform. For Heilung it is important to be as authentic as possible and in the panel they are a part of on Saturday it is abundantly clear that they mean absolutely everything they do, that it’s carefully constructed with the help of old God’s and their personal spirits. They begin with a binding circle that festival director Walter Hoeijmakers is also a part of which adds to the feeling that this means something and it’s important. Their performance is transformative and getting lost in the rhythms is something that brings much personal peace. Later Bliss Signal bring strobe lights and fiery energy to a set that is as disorientating as it is euphoric and their melding of metal guitars and electronic beats is something that many in the room tapped into for the duration of their performance – eyes closed, heads bowed and bodies moving in tandem – it was forty minutes of blinding lights and dazzling heat. Day two begins with the bleak black metal of France’s Throane who take to a stage centred around a giant dagger sculpture with flames atop its hilt – a visual representation of what the band bring to the cavernous space of De Koepelhal. Many bands this weekend fail to fill the hangar’s space with sound (Craft the biggest disappointment of all) and for Throane it could have been that a smaller venue would work better with their cloying atmosphere but the subtle textures and nuances, filled with controlled rage that seep from Dehn Sora (also performing solo as Treha Sektori and with Ovtrenoir this weekend) and his ravaged voice, curl around a rapt audience and allow them a glimpse into the darkness beyond. The premise of Triptykon performing alongside the Dutch Metropole Orkest is something that many are not sure about – how will the metal band work with the orchestra and will it fall flat somehow? The audience await this commissioned project with bated breath and the sight of the stage is enough to bring a delicious tension into the air. Having composed, with Celtic Frost, two parts of a movement entitled Requiem, Tom G.Warrior was missing the second portion for many years and during an enlightening, and truly heavy talk later in the day, Warrior speaks about how the second section came into being through a request made by festival director Walter Hoeijmakers. The performance is spectacular and hearing Triptykon work in unison with the orchestra, each becoming one with the other, is breathtaking. Rex Irae Requiem, Chapter One: Overture – Fourth Incarnation is spellbinding and the closing moments of Winter Requiem, Chapter Three: Finale – Ninth Incarnation is a moment of reflection that for many in attendance the opportunity to finally breathe again is found. It is in the newest composition, though, that moments of beauty, grief and hope are displayed and for Triptykon’s founder and Celtic Frost member Tom G.Warrior, it seems to be a place to work through emotions that have been long-buried and his feelings towards the untimely passing of bandmate and close friend Martin E.Ain. Grave Eternal Requiem, Chapter Two: Transition is a stately and moving piece that many here feel privileged to have heard for the first time. It’s not until I walk away that I realise I have been crying and I feel some relief in my heart this afternoon. Thou’s collaborative set with Emma Ruth Rundle is a wonderful meeting of minds and Rundle’s powerful voice plays off Thou’s Bryan Funck’s with ease. 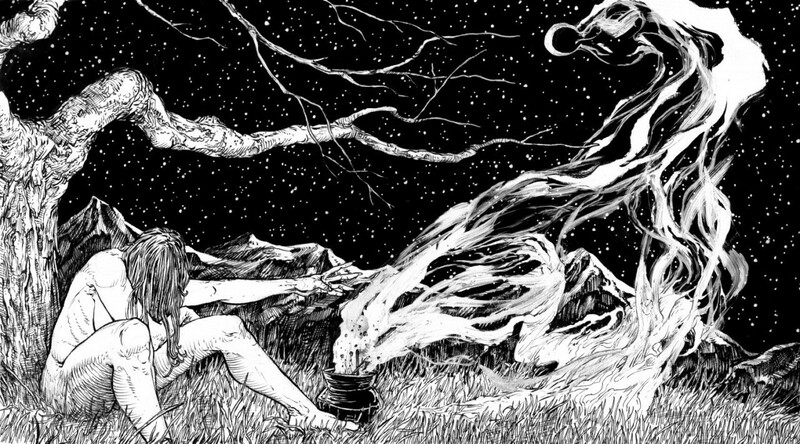 The differing vocal styles add to Thou’s layers in only positive ways and the songs they have crafted together are as confrontational as each artist’s individual works. Their cover of the Cranberries song “Hollywood” at the end is magnificent and works to their strengths as collaborative artists. Roadburn Festival is a place where many genres of music come together and co-exist and its surprising to me that so many metal fans flock to the electronic scene so readily and for Drab Majesty and their cinematic sound De Koepelhal is well attended. The duo create music that wouldn’t sound out of place on the Blade Runner OST or Cyberpunk 2077’s upcoming score and their hour long set somehow seems not long enough at all. Bosse-de-Nage close out my Friday with the kind of black metal that challenges in all the right ways. It’s weird and punky and staccato and the bizarre (almost) spoken-word vocal style is something that not everyone will enjoy. The band are already five albums in and their surreal take on the genre is perfect for a festival so enraptured with curating the most intriguing line-ups.